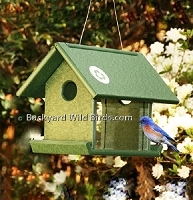 Bluebird Coaster Set is 4 absorbent stone coasters with their wooden holder. 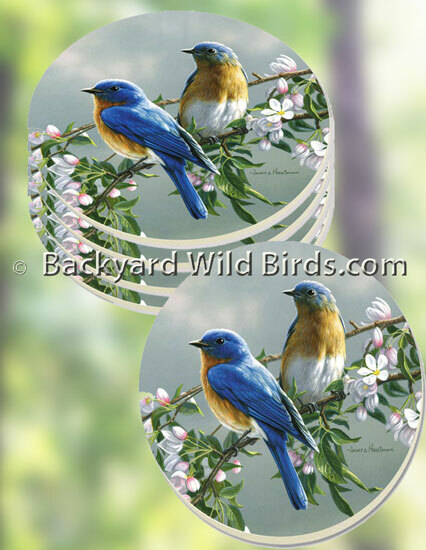 These Wild Bird Coasters are very nice artistic renderings of Bluebirds, a favorite backyard bird in springtime. The coasters come with a circular wood holder with side cut outs for easy access. The surface of the coasters is porous allowing the coaster to absorb condensation off drinking glasses. They also have a nice cork backing so as not to scratch and keep raised off of surfaces. These coasters match our Bluebird Coffee Mug Pair and make a charming gift set. Order your absorbent 4 inch stone coaster with cork backing today or give as a gift.